Universal Motion Screens — Cutting Edge Window & Screen, Inc. Imagine a world without a fixed screen to obstruct the view from your patio, porch, lanai, veranda, or balcony. Imagine a world where at the touch of a button you instantly screen your exterior living space. Imagine a world where you can leave your garage door wide open and work freely with superb ventilation and protection from pesky bugs and mosquitos. Whether you are looking for pest protection, solar protection, or privacy, our Motorized Retractable Screens are versatile and serve many purposes. Motion Screens transform any architectural openings into a desired and functional living space. Universal Screens now offers Somfy Maestria™ 50 RTS! Universal Motion Screen is custom manufactured to fit most standard and oversized applications and is the best Power Screen on the market. We manufacture our power screens in our facility in Plano, Texas and we are very proud to say "Made in the USA!". Enjoy your mornings and sunsets on your patio, deck, lanai, or veranda to the fullest without the hassle or worry of keeping out unwanted bugs. At the press of a button, the Universal Motion Screen smoothly and silently glides down into place transforming your outdoor living space into a fresh, ventilated, pest-free environment. you and your family will completely enjoy all of the amenities of your home day or night, anytime you desire. We offer 7 standard colors designed to blend stylishly with the decor of your home and also have the ability to custom match any color. There are also a variety of meshes available that offer solar protection, privacy and full ventilation. With a touch of a button the Universal Motion Screen is there when you need it, and gone when you don’t! We stand behind our product with a lifetime warranty on all parts (excluding mesh) as well as one year on labor. This is the longest warranty in the industry. SuperScreen (which is an option on all of our screen systems) is 3 times stronger than traditional mesh and is perfect for pets and children. Unlike any competitive screen, the Universal has "Teflon welded mesh" at the top and bottom of the screen. The welds provide durability and strength to prevent frays and tears. You will find that SuperScreen has been engineered to exceed your expectations and will provide years of quality service. With our solid clear vinyl material, you can convert any space into a real four season room. Mostly commonly installed on homes, there is a fast growing use of this product for commercial applications. Customized to each building project, our Motorized Retractable Screens merge perfectly with the décor to maintain the integrity of your design. These retractable screens can be recessed from view, or mounted on existing structures. Our Motorized Retractable Screens can be integrated into every type of architectural style including wood, brick, stucco, natural stone, and concrete. 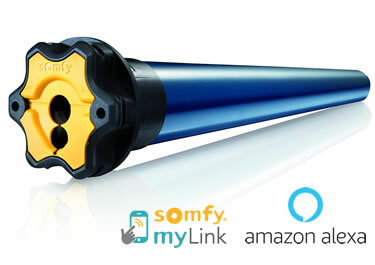 Many remote options from Somfy.